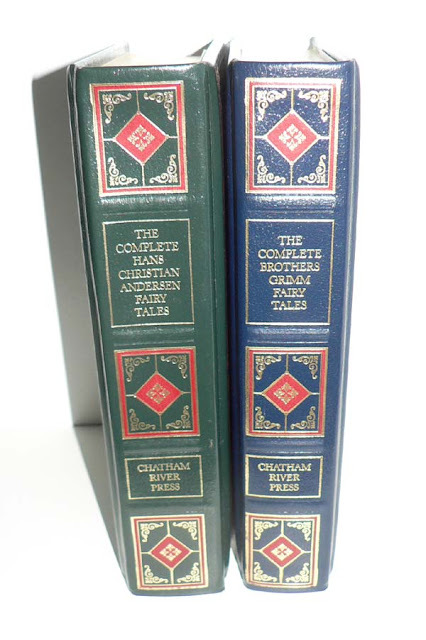 "The Complete Hans Christian Andersen Fairy Tales" and "The Complete Brothers Grimm Fairy Tales" both published by Chatham River Press, 1984. Bound in "genuine bonded leather" with gilt decoration and lettering. Each book is about 800 pages and contain black and white illustrations from various artists. This is the best giveaway ever! These look awesome! So fun and just a little bit creepy! Would love to enjoy these! I would genuinely like these. The illustrations are lovely! These are the kinds of books that made me love fairy tales and that I hope to have around so my future children will too! 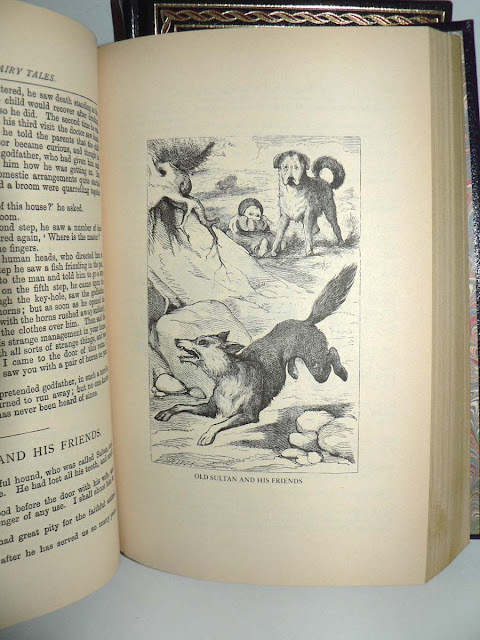 Love the drawings in there as well, reminds me of original Alice in Wonderland! These would be fabulous to win!! I'd love these to read to my grandkids! Totally love fairy tales. And these are beautiful! Beautiful books! Please count me in for the giveaway! Love these books - they look amazing! I used to read these to my children! I have a new grand baby due in a month...I would love to start a new generation tradition! Beautiful set. I would like this set for my grandchildren. Thanks for the opportunity to enter. I would like these for my grandchildren. Thank you for the opportunity to enter. Absolutely beautiful! The fairy tale is one of my favorite genres, which is one main reason why I'm a huge fan of Once Upon a Time on TV! 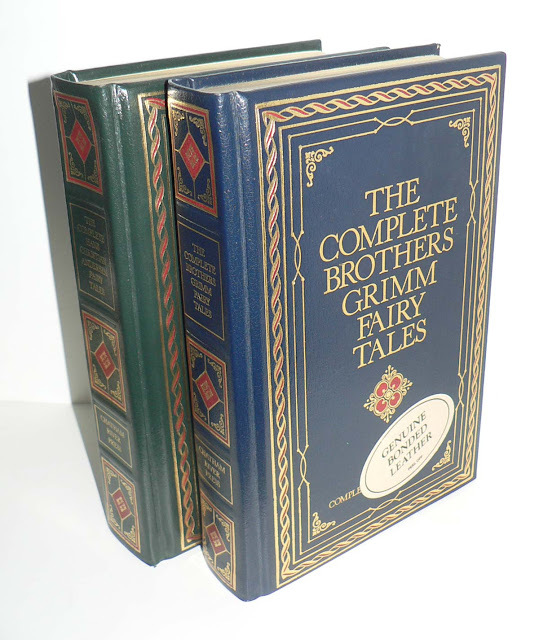 We've been looking for a good edition of the Grimm's stories for our daughter for months. The illustrations are perfect. So beautiful! I've got my fingers crossed. ooh definitely count me in!!! Sign me up! Those are beautiful! Sign me up! So beautiful! I just recently found you in my blog wanderings and was thinking how fun it is to find some of those forgotten bookmarks. Please enter me in your giveaway (your newest follower). oh, I would love to have these, illustrations to study!! Thanks for sharing them. Just learned of your blog today from the article on Huffington! Makes me want to open a used free bookstore in the basement! Totally awesome set of books! I LOVE fairy tales! Hope I win! I've been wanting a Brothers Grimm set for years! Great giveaway! I grew up on HC Andersen...would love these! A nice pair :) Thank you! Yes please. Would love to have these! Ohmigod, WANT. Pick me, please! When my daughter saw this comment she gasped and moaned. If we won, I know these two anthologies would be loved. Beautiful editions that I would love to own! Add me to the drawing if you please. Thanks for the weekly giveaways, please add me in the drawing. Wow, these are beautiful! Thank you for the chance to win! I would love to win those books! Thank for having your weekly giveaways, even though I don't win, it's fun to see the books. I just found your blog and love it. I love collecting books and have a few cookbooks I picked up at flea markets with notes and handwritten recipes tucked inside. I love to win I remember reading these stories as a child. After I wrote this comment, I will go to cross my fingers and will not un-cross them until the results of drawing! These would be great in my fifth grade classroom. Fifth graders love "kinda creepy." Would <3 2 win this!